Oatmeal raisins cookies are one of my family’s favorite cookies. The only problem is, its recipe includes wheat flour, eggs, and milk – all the things we are allergic to. I tried baking without them since we miss baked goodies so much but I’ve failed miserably many times. Granted, it’s asking a lot, I mean, A LOT, when you’re using ingredients with different chemical structures to expect same textures and taste. Still, it would be nice if food turn out the way I imagined. Is that asking a lot? 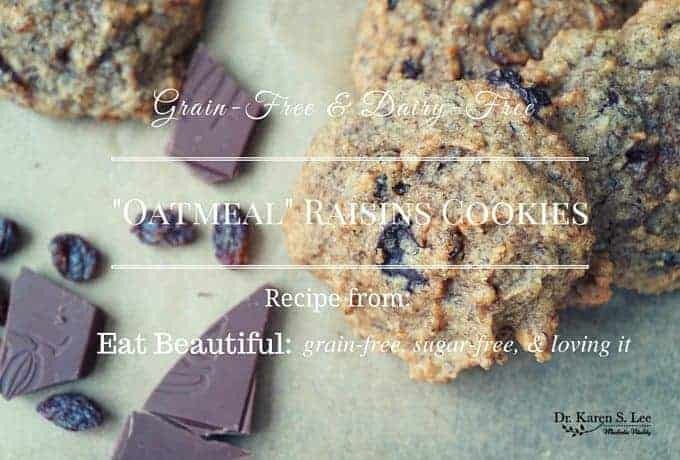 Here are Oatmeal” Raisins Cookies (Grain and Dairy Free) from Eat Beautiful that won’t disappoint! Seriously, cooking without these ingredients just isn’t that intuitive for me. However, some cooks do it better than me and Megan Stevens of Eat Beautiful is one of those cooks whose recipes don’t fail me. So when I heard she wrote a cookbook called “Eat Beautiful: grain-free, sugar-free, and loving it” (Amazon link), I had to take a peek. 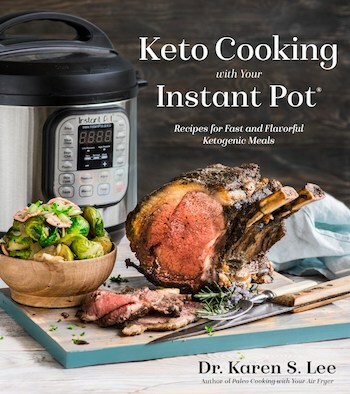 I’ve used her GAPS and AIP friendly recipes based on WAPF on her site in the past so I knew this book would be amazing. 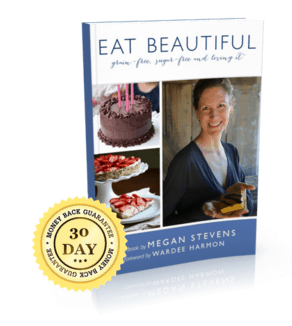 Here is an interview with Megan, explaining why she started on this special diet journey and how she got to write such a challenging cookbook. Megan, first of all, congratulations on writing such an amazing cookbook! I know firsthand how cooking without wheat, dairy, and eggs can be challenging without losing the ‘traditional’ texture and taste but your book suggests substitutes that work! I loved your “Oatmeal” Raisins Cookies recipe! They smell and taste like the ‘original’! So how did you decide to write this cookbook? Thank you, Dr. Karen. I’m glad you enjoyed the cookbook! And I’m happy that you enjoyed making (and eating) my “oatmeal” cookies! It’s great to see my recipe being shared on your site! To answer your question, I’ve suffered from many illnesses, ranging from a variety of autoimmune diseases, arthritis, and Hashimoto’s for years. My health was so bad that several years ago, my doctor told me I didn’t have long to live. My husband and I said goodbye to each other. That’s how grim my health was. Then, I found out that my poor gut health was what was causing my illnesses. Also, I learned that my children’s allergies and asthma were due to their poor gut health. We were eating a Weston A. Price Traditional diet at the time, but prior to that time I’d been exposed to heavy regular doses of antibiotics, was a vegetarian, wasn’t breastfed and ate lots of whole grains without pre-soaking or using sourdough to pre-digest. I learned that we needed to change our diet to be grain-free and refined-sugar-free, choices that aid in gut healing. So, I changed the way I cooked for the entire family and we were also able to put some of my kids’ conditions into remission. To share my family-approved, gut healthy recipes, I decided to compile all our favorites and write a cookbook so others can enjoy the new techniques as well. Sorry you had to personally experience all those health issues to discover allergy free cooking. From looking at the recipes, they are not that easy to develop unless you know what you’re doing. Are you a trained chef? I am self-taught. I was trained somewhat in Seattle as a kitchen sushi chef; but the Japanese culture is still dubious of women’s abilities, so they called me a “kitchen helper,” LOL. Most of my training comes from watching my mom growing up, reading many many cookbooks in my formative years, cover to cover, as if they were novels; and then now we own a cafe and I am the primary chef for all the food served. I also teach cooking classes, based on the teachings of Weston A. Price, Sally Fallon and Dr. Natasha Campbell-McBride- so Traditional and GAPS techniques, ones that aid in digestion. That’s so cool that you own your cafe to cater towards customers similar to you. They are so lucky! I wish I lived closer! What is the name of the shop and where is it located? What kinds of foods do you serve? The cafe is called, Vanilla Jill’s Scoops and Soups, and is in Eugene, OR. It’s Traditional, GAPS and Paleo cafe. So we serve real sourdough gluten-free waffles, Paleo waffles, grass-fed ice cream and frozen kefir, bone broth, bone broth soups, Paleo sandwiches, dairy-free ice creams that are Paleo and GAPS-friendly, made with coconut or sprouted nut/seed milk. Everything is homemade and organic. The meat is organic and grass-fed. No polyunsaturated fats, only Traditional fats. We also make our own jun and sell kombucha on tap, as well as gluten-free alcohol and bulletproof coffee and teas. We also make Paleo/GAPS/Traditional baked goods: parfaits with grass-fed creme fraiche, scones, donuts, bread pudding, brownies etc. We’re closed for December but you can check out our Facebook page Vanilla Jill’s Scoops & Soups. What types of ingredients do you like to use as substitutes and do they work? My cookbook uses a variety of gluten substitutes. Many of them use soaked nuts; but if you’re allergic to nuts, then, some use seeds or coconut flour. I never use nuts flours or butter that are store-bought. My methods are easy, but I am wary of factory-made products that are often rancid and not easy to digest. I know you’re still on GAPS diet so you made sure to carefully select ingredients. Can you truly eat all the recipes in this cookbook when you are on GAPS? Most of them, assuming someone doesn’t have additional food allergies, such as not being able to eat eggs or dairy. In that case, there are MANY recipes that are dairy-free or egg-free, and 28 that are both. 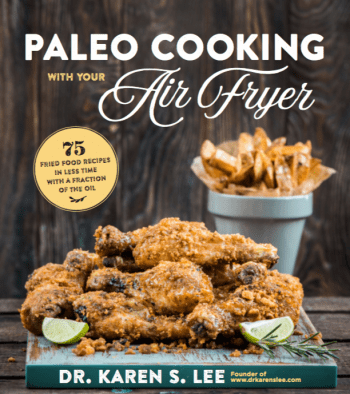 However, one exception is that I do mention hardwood-derived xylitol in this cookbook, as an option for those who are struggling with extreme sugar addiction, who may have diabetes or pathogen overgrowth. This alternative sweetener is not GAPS approved; and yet it helped our family to maintain a strict GAPS diet in all other ways, and thus helped us to overcome our own sugar addictions and to get well. So I see a place for it, in extreme cases. There is also one AIP recipe that uses plantains, and plantains are not GAPS. Thanks, Megan for writing such a great cookbook! 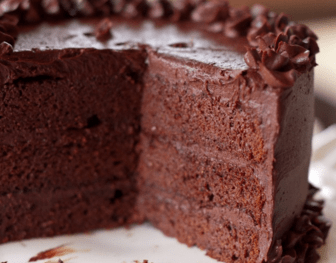 The recipes are not only perfect for those of us who can’t enjoy baked goodies for one reason or another but really, they are great for anyone who wants to eat healthy. And thank you for allowing me to share your grain free “Oatmeal Raisins Cookies” recipe with my readers and offering to giveaway a copy! You’re welcome. It really is my pleasure to help others along in their healing process. I’ve been there, and I know how important it is to have treats that won’t sabotage, but instead, they help one to feel content, so healing has time to happen. As I mentioned in the beginning, I lost the confidence to come up with ways to use substitutions to make cookies taste like the way they should until I tried Megan’s famous “Oatmeal” and Raisins Cookies recipe. And just like she said in her book, they smell like oatmeal raisin cookies when they are in the oven! The warm smell wafting through the house made me feel like baking again. NOTE: I added dark chocolate pieces to the recipe because, well, it’s chocolate. But it’s totally optional. Lightly grease 2 baking sheets or line them with parchment paper, and set aside. (I use silicone cookie sheet, like Silpat). Or use coconut oil spray. Place the nuts, eggs, coconut oil, sweetener and vanilla into a blender jar. Puree on medium-high speed until the cashews are smooth, about 50 seconds. Transfer this wet mixture to a medium-size mixing bowl. set aside. In a small bowl, sift together the flaxseed meal, cinnamon, baking soda, sea salt and stevia. pour the dry ingredients into the bowl with the wet ingredients. Use a hand-held or free-standing mixer (or deftly mix with a wooden spoon) to combine the ingredients thoroughly but without over-mixing. Use a spatula to scrape up from the bottom the nut puree, making sure the bottom and sides are incorporated into the body of the batter. Allow the batter to ‘set up” for 10 minutes. Scoop mounded cookie batter onto prepared cookie sheets - preferably using a 1-2 ounce ice cream scoop with an automatic release mechanism, or a heaping tablespoon - about 1 inch apart. Bake 10 to 15 minutes, until the cookies are puffed in the center, golden on top and light brown around the edges. Cool 10 minutes on the baking sheets before removing the cookies to baking racks or cut-open paper bags to cool completely. Disclosure PolicyThis post and recipe contain affiliate links for products or services that pay this site small commissions if purchases were made through them at no additional cost to you. Read full disclosure here. 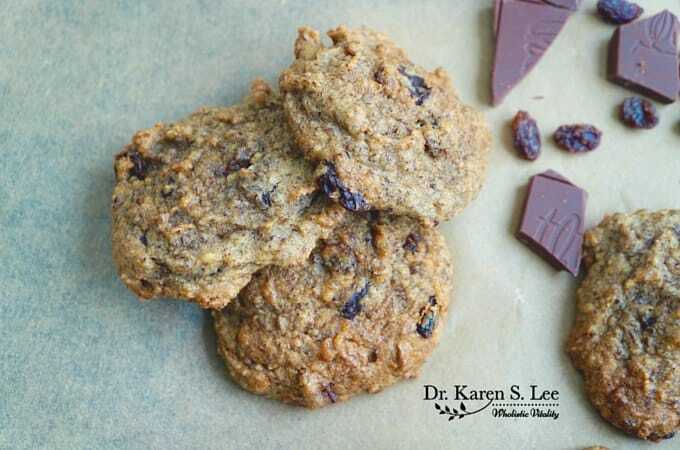 Tried this recipe?Mention @drkarenslee or tag #drkarensleerecipe! Send me posts like these!